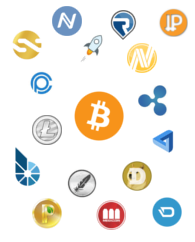 Altcoins – Diversify your Crypto Currency Investment! With the general value surge the crypto currency sector has seen in the last few months, money began pouring in from “squares,” resulting in what may well indeed be a bubble effect. Despite some market analysis factors pointing to the presence of the dreaded bubble, Bitcoin, the top dog of the virtual currency world, has been holding fast above $2,000, weathering the storm of volatility. While Bitcoin has indeed hogged most of the limelight over this period of wild gains, the most impressive performance was logged by Ethereum, another virtual currency, which – according to some – may soon grow to replace Bitcoin at the top of the crypto currency food chain. Ethereum has appreciated by some 3,000%, putting Bitcoin’s 300%+ gains to shame. Indeed, if someone held an arbitrary amount of Ethereum before the rally, his/her returns on the investment would’ve been in excess of 3,000%…that is quite ridiculous indeed. Apparently though, Ethereum is not done rallying, and the fact that it’s currently jostling in the $300-$400 price range still makes it very affordable to would-be investors. At close to $3,000, Bitcoin seems to have pulled away from the reach of the average Joe, although that’s not really the case. Bitcoin can be broken down into extremely small subunits, which are obviously still affordable. The problem is rather that the general feeling about Bitcoin seems to be that it has less room left to grow than say Ethereum, which is yet to run the path already proven feasible by Bitcoin. In layman terms: people find it quite likely Ethereum will follow in the footsteps of its predecessor, and thus picking up some now, while the price is low, makes a lot of sense. ICO’s have played a crucial role in the strengthening of Ethereum. These offerings are about digital tokens that can be purchased on the Ethereum network, which grant exposure to various new ventures. Conversely, ICO’s may in fact be the Achilles’ heel of the Ethereum project too. It is due to these ICO’s that the amount of purchasable Ethereum is extremely limited. Unlike Bitcoin, the Ehtereum network doesn’t have a scaling dilemma. Indeed, the actual numbers in this regard are rather telling, as are those concerning the sudden market cap increase of Ethereum. While Bitcoin’s market cap is currently around $43.5 billion, Ethereum has made strides closing the gap. It is now at $35.8 billion and it’s catching up. In regards to network nodes, 24-hour trading volumes and 24-hour transaction numbers, Ethereum has already overtaken Bitcoin. Another crypto currency investment alternative for Bitcoin – one that’s possibly even more attractive than Ethereum – is Litecoin. One of the longest-running yet oft-ignored blockchain projects, Litecoin is relatively cheap right now, yet interest in it is rising, thanks to a series of factors. The most important of these is the impending implementation of SegWit (Segregated Witness), a scaling solution invented for Bitcoin. Due to political wrangling, Bitcoin has thus far failed to enact the upgrade. Litecoin on the other hand has recently secured support from the majority of its miners. The 75% threshold has in fact been surpassed, meaning that if this holds out for a couple more weeks, the code will in fact go live. In anticipation of the upgrade, the price of Litecoin has already experienced a bump, but it is indeed still very affordable and its upside is more promising than ever, with plenty of room for growth. The bottom line is that yes, Bitcoin is still a profitable long-term investment vehicle, but with currencies like Ethereum and Litecoin, profits may indeed come about much sooner. Market corrections hitting Bitcoin are still affecting Ethereum and Litecoin too, but given the actual fiat money values involved, variance on ETH and LTC is quantitatively smaller too.